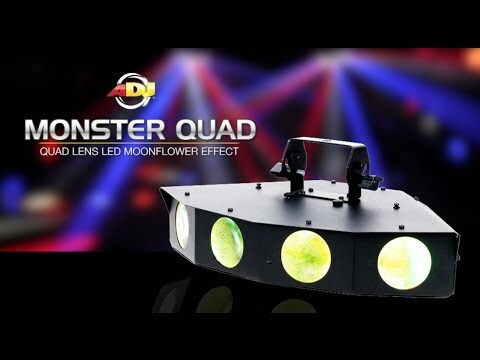 The ADJ Monster Quad is a four lens high output Moonflower effect that is powered by 25 1-Watt RGBWA LEDs (5x Red, 54x Green, 5x Blue, 5x White, & 5x Amber). 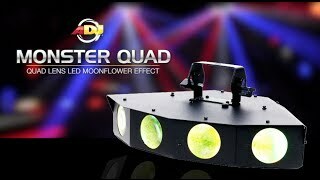 With a very wide 93-degree beam angle, vibrant colors and 12 built-in shows, the Monster Quad covers a large area of a dance floor and bring pure lighting excitement to any party. Considering purchasing the American DJ Monster Quad? Have questions? Ask people who've recently bought one. Do you own the American DJ Monster Quad? Why not write a review based on your experience with it. A 1watt led might sound small but in this unit it is the total opposite. You get really nice looking effects out of this fixture and at a great price! And even better because it is DMX controllable!!! Seen a video for American DJ Monster Quad online or have you own video? You will earn 580 loyalty points with this product worth £1.45, when logged in. Check out American DJ Monster Quad on DJkit.com!